The Fall cover dog season is in full swing and so far the Wild Apple Dogs are doing well. Our first trial was the Maritime Grouse Classic over in McAdam, New Brunswick. In the Classic Tim Kisieleski handled Wild Apple Polka Dot to the runner-up ribbon. 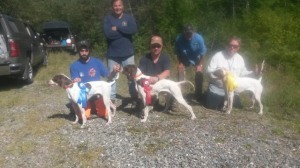 On the left, Joe Dahl with the winner, Fernwood Cove Bella and Tim with the runner-up Wild Apple Polka Dot. In addition to Dottie, I ran Spot, that was a “little” rough on the tight course he drew, Sam, Brandy, Wild Apple Mollie McGee, and Striking Elhew Lexi. Lexi didn’t have a bird but the judges made a point of telling me that hers one the races they like the best. Molly was putting down a really strong ground race and was the only dog in the stake that pointed a grouse but went with it when it walked out in front of her on open ground. We though Brandy did well enough to get a piece of it but was edged out by Bella and her kennel mate Dottie. Sam ran well but knocked a woodcock on a relocation. In the companion stake, Andy Wishart Memorial Open Derby, I handled Wild Apple Jonathan to first place with a nice woodcock find and Elhew Unsinkable to third with derby manners on a grouse and a nice race. Some commented that they thought her race was better than the dogs with more polished bird work. Last Fall I sold Jonathan’s brother, Wild Apple Pippin to Chris Munn up in New Brunswick and Bob Little handled him to second place in the derby. From the left, Wild Apple Jonathan, Wild Apple Pippin, and Elhew Unsinkable. 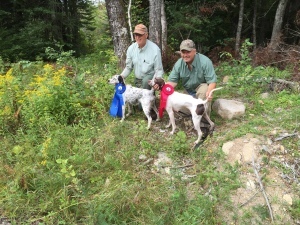 Last week we ran at the New England Open Grouse Championship that Dave Hughes won with Straight Forward and had strong runs from the girls, Sam, Brandy, and Dottie with Brandy maybe the strongest on the ground andDottie with the best overall performance with a good race in near 80 degree weather and 2 woodcock finds. 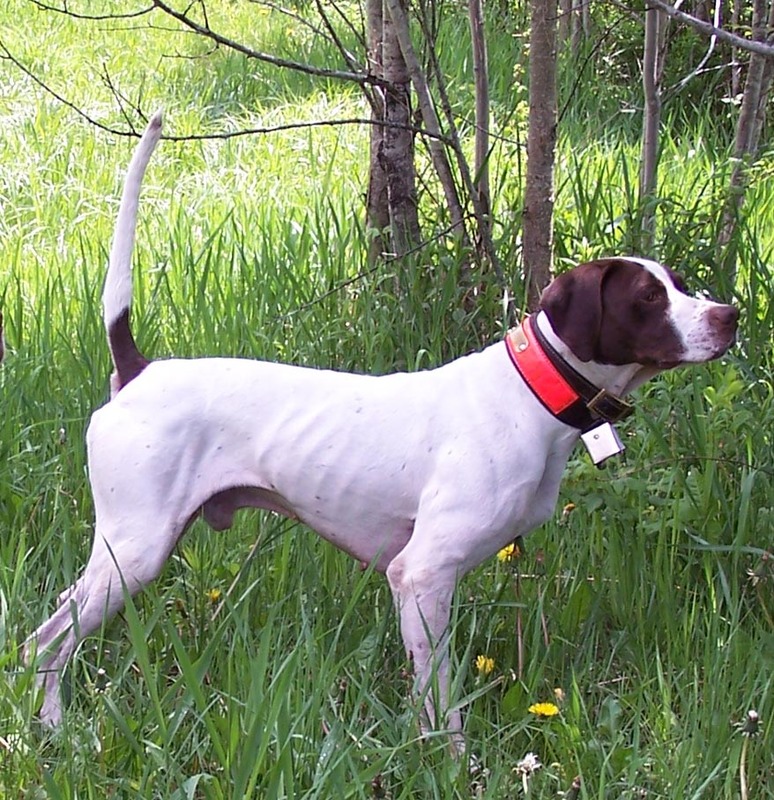 Sam has been coming along this summer and put down a race that would be good enough to win had she had a grouse find. Spot showed that he is still only two by running strong for 20 minutes and then failing to back on what turned out to be a non-productive point for his bracemate. 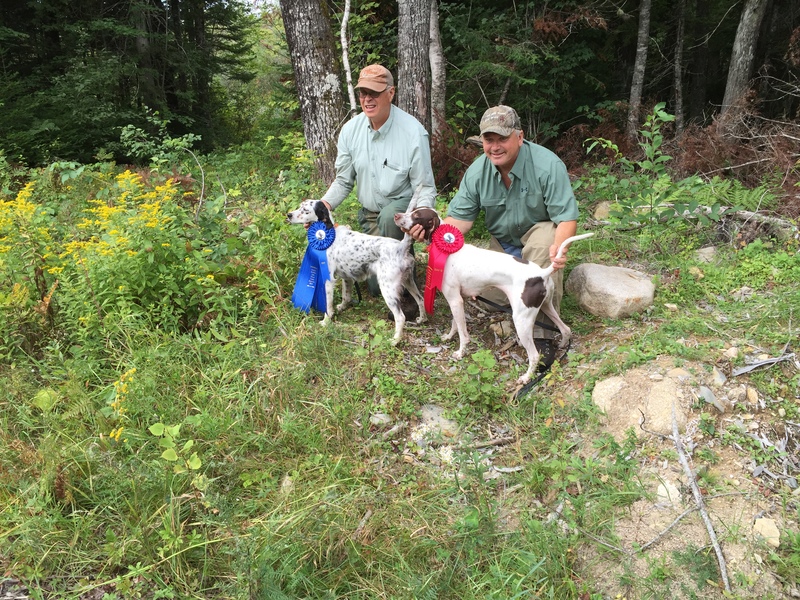 This past weekend was the Northeastern Grouse and Woodcock Championship over south of Bangor, ME an ably run by the Midcoast Maine Field Trial Club. The Saturday night lobster feed is almost worth the trip in and of itself. The club had to deal with some last minute course problems as the town had decided to cut heavily and were able to get in early because of the dry summer. All of course three and part of course two were gone. they will be back and better than ever in a relatively short period of time but for this year the club members had to do some emergency course work. A new hour course was laid out over on Al Robbins training grounds about 20 minutes away and course two was salvaged by twisting and turning through and around the beaver ponds. It made for a tough course to show a dog on but in the end both the winner and runner-up were on that course. Bear River Partridge Berry ran on it mid day on Sunday and did as well as you could ask a dog to coupled with a nice piece of work on 2 or 3 grouse to take the runner-up slot. On Saturday afternoon, Tim Kisieleski’s Wild Apple Calvados ran on the same course with the wind blowing hard enough to make it difficult to hear the bell. The dense cover never slowed her as she ripped through the course making big field trial type casts and punctuated her strong race with a flawless piece of work on a grouse that she had neatly pinned in the grass surrounding a small alder patch. I felt really good about her performance but didn’t see all the braces and there were about six of the 36 dogs that the gallery speculation thought might be in it. So, I was very pleased at the announcement that Wild Apple Calvados was named the 2016 Northeastern Grouse and Woodcock Championship winner. Brandy is just 3 and is by Autumn Moon out of Coverdog Covergirl that was owned by Jack Harang. She will have many chances to improve her record going forward. 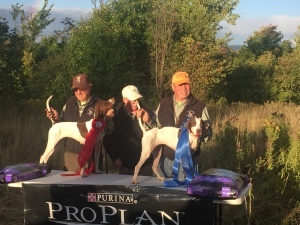 Winner Wild Apple Calvados with her handler Craig Doherty and Runner-up Bear River Partridge Berry with Bob Little. 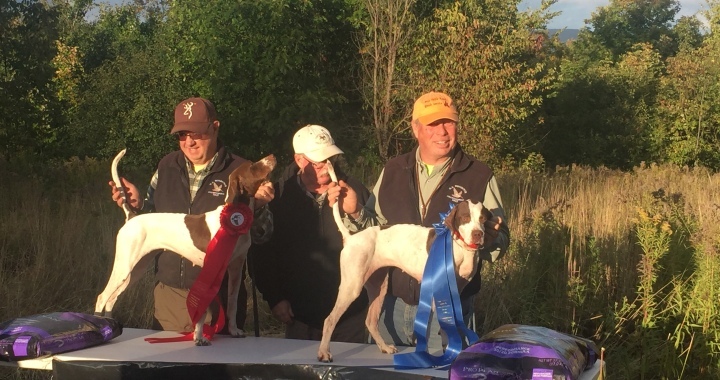 I will be home this weekend hunting with friends and clients but the dogs will be at the North American Woodcock Championship and the Futurity with my Kennel Boy, Tim Kisieleski. With four dogs in each event he should have the dog power to get it done but it always takes a bunch of luck as well.